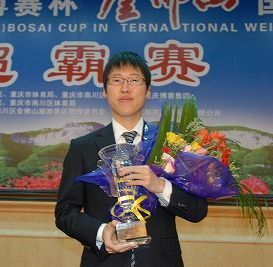 Korea’s Lee Sedol 9P (l) has added the Chunlan Cup to his already stuffed trophy case. Lee had never won the Chunlan before and the 8th annual edition – a best-of-three international tournament — began June 27 with Lee defeating China’s Xie He 7P by resignation after a hard fight. Xie, playing black, evened the score on June 29 in a second-round game that’s already been the subject of much discussion because the players created a new pattern in the top right, starting with Lee’s move 18. 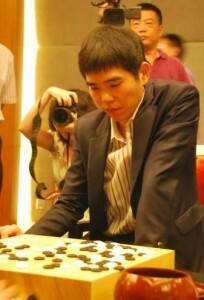 Lee held white again in the deciding match on June 30. Despite losing Game Two, he tried the new move again and his perseverance paid off as he won the game and the tournament. Lee now adds his first win in the Chunlan Cup to his already impressive record. For those interested in the new joseki, see An Younggil’s Game 3 commentary. - Jingning, based on her original reports on the 8th Chunlan Cup at Go Game Guru.